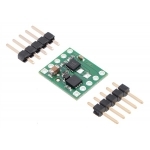 This compact breakout board for Maxim’s MAX14870 motor driver offers a wide operating voltage range of 4.5 V to 36 V and can deliver a continuous 1.7 A (2.5 A peak) to a single brushed DC motor. 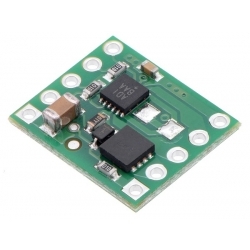 It features a simple two-pin speed/direction interface and built-in protection against reverse-voltage, under-voltage, over-current, and over-temperature. 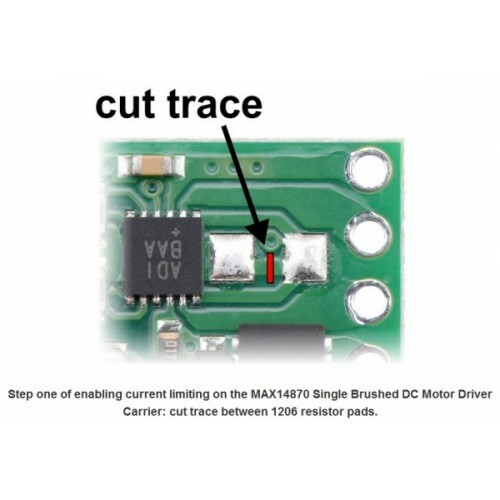 The MAX14870 from Maxim Integrated is a tiny H-bridge motor driver IC that can be used for bidirectional control of one brushed DC motor at 4.5 V to 36 V. It can supply up to about 1.7 A continuously and can tolerate peak currents up to 2.5 A for a few seconds, making it a good choice for small motors that run on a wide range of voltages. Motor and power connections are made on one side of the board and control connections are made on the other. The driver requires an operating voltage between 4.5 V and 36 V to be supplied to the reverse-protected power input, VIN. 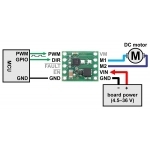 The VM pin provides convenient access to the reverse-protected supply voltage. 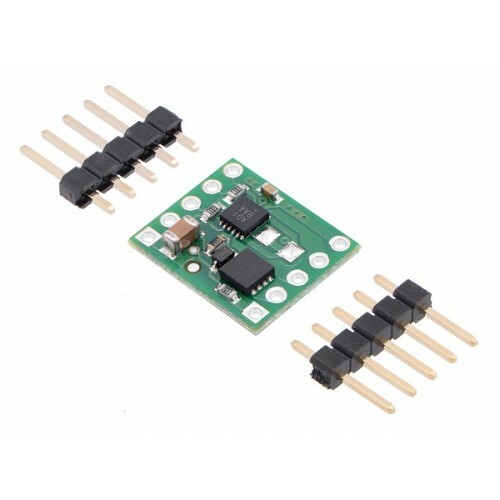 The MAX14870 offers a simple two-pin DIR/PWM control interface, where the DIR pin determines the motor direction and the PWM pin can be supplied with a PWM signal to control the motor speed. 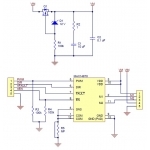 The PWM control input is pulled low on the carrier board through a 100 kΩ pull-down resistor. 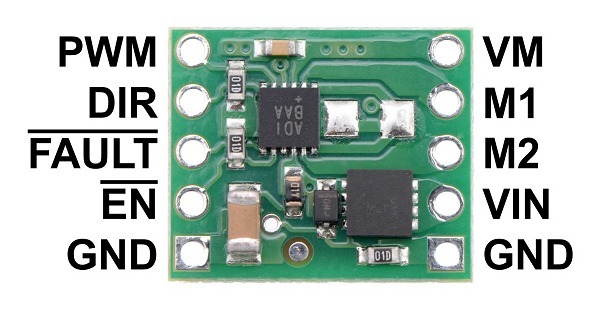 When the PWM pin is low, the motor outputs are both shorted to ground, which results in dynamic braking of a connected motor. 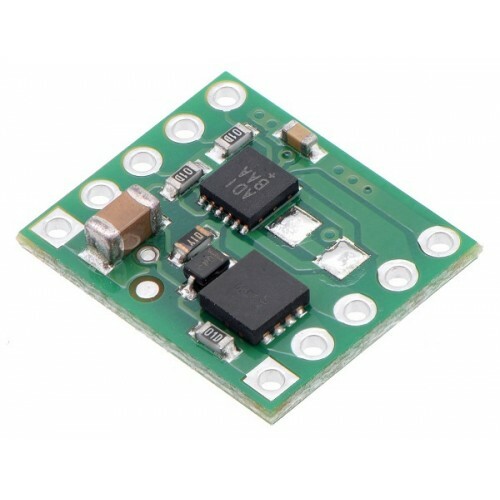 The EN pin can be driven high to turn off motor outputs, which is useful if you want to let the motor coast. The EN pin is pulled low through a 100 kΩ pull-up resistor on the carrier board so that the driver is enabled by default. 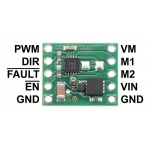 VIN Reverse-protected power supply input; supply this pin with 4.5 V to 36 V.
GND Ground connection points for the power supply and control signals. 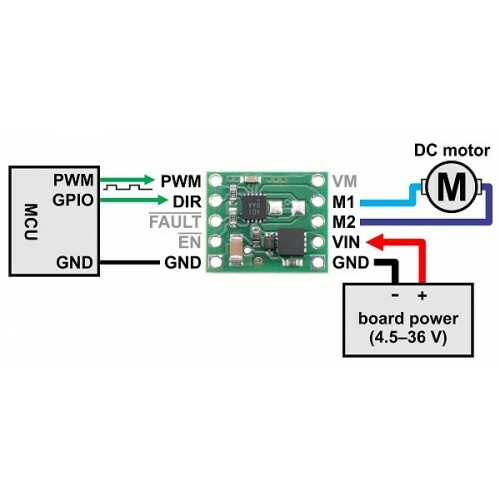 The control source and the motor driver must share a common ground. 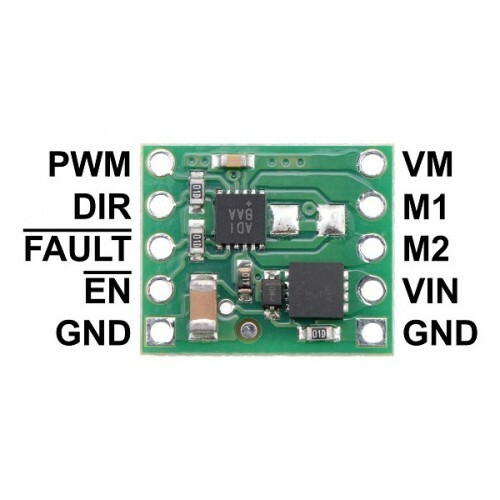 VM This pin gives access to the motor power supply after the reverse-voltage protection MOSFET (see the board schematic below). It can be used to supply reverse-protected power to other components in the system. This net connects to the pin labeled “VDD” in the MAX14870 datasheet. 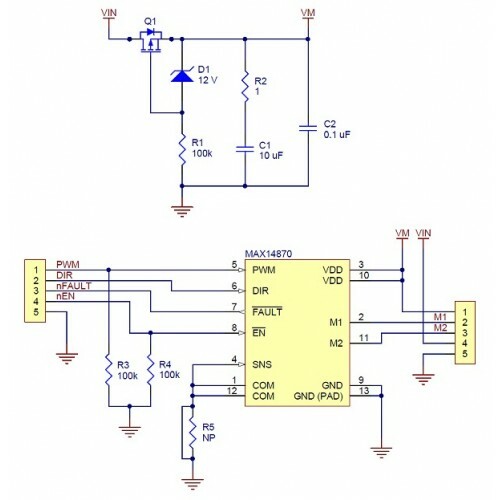 PWM LOW Speed control input; logic high causes the motor to drive. FAULT FLOATING Open-drain, active-low fault output. 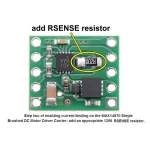 This pin goes low during an over-current or over-temperature condition. 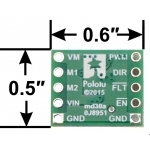 You must use an external pull-up resistor to give this pin a default high value if you want to use it. 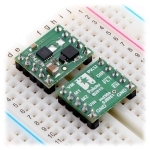 EN LOW Active-low enable input; drive high to tri-state the driver outputs. 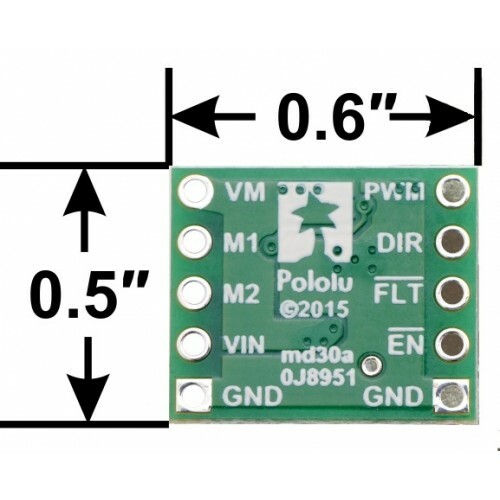 The driver tries to keep the voltage on the SNS pin from exceeding 100 mV, so for example, a 100 mΩ resistor limits the current to 1 A and a 200 mΩ resistor limits it to 0.5 A. 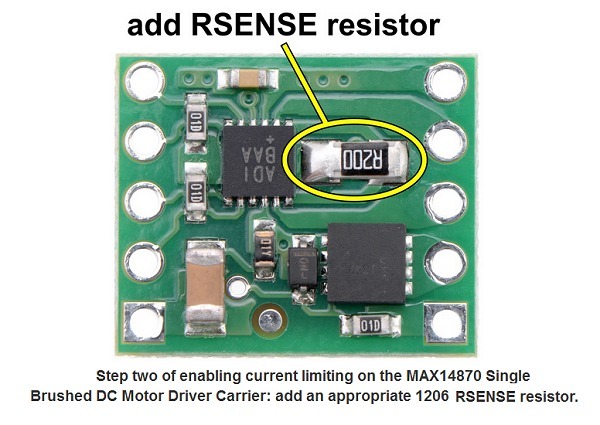 For more information on current limiting refer to the datasheet. 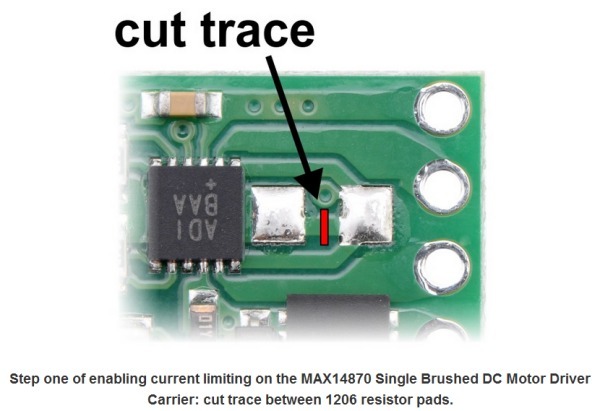 The MAX14870 datasheet recommends a maximum continuous current of 2.5 A. However, the chip by itself will typically overheat at lower currents. In our tests, we found that the chip was able to deliver 2.5 A for only a few seconds before the chip’s thermal protection kicked in and disabled the motor outputs; a continuous current of 1.7 A was sustainable for many minutes without triggering a thermal shutdown. The actual current you can deliver will depend on how well you can keep the motor driver cool. 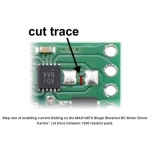 The carrier’s printed circuit board is designed to help with this by drawing heat out of the motor driver chip. Our tests were conducted at 100% duty cycle with no forced air flow; PWMing the motor will introduce additional heating proportional to the frequency.